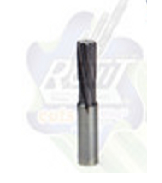 Rohit Solid Carbide Reamer or Straight Flute Carbide Machine Reamers are specialized for reaming holes to very strict tolerances, as accurate upto 3 microns. - Straight flute Carbide reamers are best suited for non-chip forming materials, i.e. cast iron, bronze and free cutting brass. For high performance precision reaming in machines, High cutting parameters mean high productivity and, Excellent surface finish on the component. We manufacture and supply a wide range of High Finish HSS & Carbide drills, reamers. These are especially designed by using advanced production technology as per the defined industry standards. Solid Carbide valve guide reamers . We offer best quality Jabro Solid Carbide Reamer and End Mill Cutter & Drill. These cutting tools are in accordance with the industry requirements and guidelines. Backed by massive industry competence and experience, we have come up with a fine quality Solid Carbide Helix Flute Reamer. With sincerity and hard work of our experts, we have carved a niche for ourselves in this domain by manufacturing Solid Carbide Reamer.